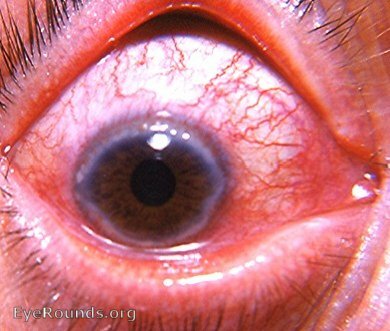 The photo presents an unusual corneal reaction in a case of allergic keratoconjunctivitis. The edematous epithelium involves the limbal arcade zone circumferentially for its 360 degrees but does not extend beyond its corneal border. There was complete clearing of this allergic response of the eye through the use of topical steroids.